Toys for Bob, the original developers of Skylanders (and a subsidiary of Activision), recently donated hundreds of Skylanders toys and products to The Strong Museum. The Strong National Museum of Play houses the International Center for the History of Electronic Games, and the World Video Game Hall of Fame. The donated collection includes more than 200 pre-production figures and portals, including hand-sculpted prototypes. Among the prototypes is the fist ever working Portal of Power. The donation also features 1,000 pages of records, such as artwork and production schedules. And of course, hundreds of retail figures and toys. As part of the collection, The Strong interviewed several staff members from Toys for Bob to provide video interviews and insight. The Strong is an interactive, collection-based museum based in New York City, and one of the largest museums in the country. It’s home to the National Toy Hall of Fame and Video Game Hall of Fame. Skylanders fans haven’t been feeling confident about the series lately. 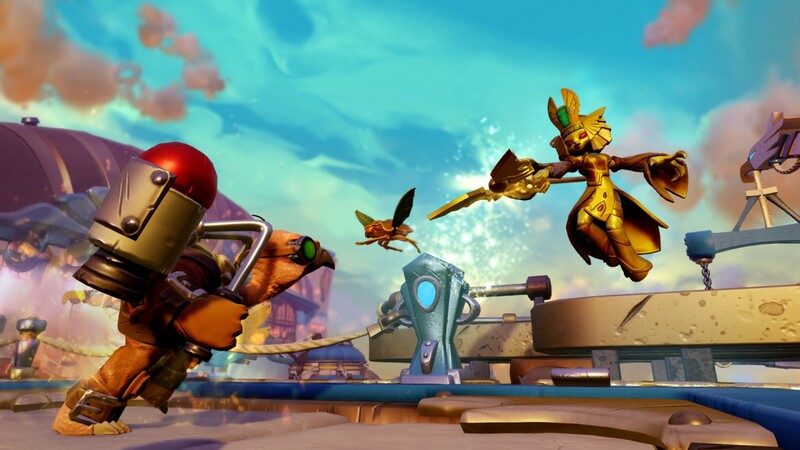 Activision announced last year that there would be no Skylanders 7 release, the first year a new Skylanders game hadn’t released since the series began in 2011. We’ve been given no new updates on the future of the once stalwart kid-friendly franchise. Yet the series has not yet been officially canceled (unlike Disney Infinity) and a third season of the solid Netflix Skylanders Academy series is due to air later this year. For now fans can revel in the sales of older games and figures. Whether you’re a newcomer to the toys-to-life series or a reminiscing veteran, we’ve compared all six primary Skylanders games and ranked them from weakest to strongest. New Gimmick: Toys to life! Once upon a time, toys-to-life was a relatively brand new concept. Activision and Toys for Bob looked for a recognizable, kid-friendly gaming hero to leverage. Enter Spyro, the sassy but good-natured dragon, who helped pave the way for an all-new action series using physical figures as a unique form of DLC. Spyro’s Adventure may earn points for being the original, but it just doesn’t hold up when compared to later entries. That’s more a testament to how well the series has steadily improved rather than any glaring weaknesses in the original game. A second Skylanders game the very next year raised a few eyebrows, but Skylanders assuaged many fears by seamlessly carrying over all previously leveled figures from the first game, creating an important precedent that cemented the series’ popularity for years. Out of all the games here, Giants is the safest sequel, not rocking the boat too much but still steadily improving on level and figure design. The new Giants gimmick likewise wasn’t anything fancy. They were big, lumbering brutes who are almost more of a hassle to play than anything else, though the actual designs are fun, like Eye-Brawl who could detach his giant flying eyeball. By the fifth entry, Activision was looking at other successful family-friendly series to add a whole new dimension to Skylanders. They settled on Mario Kart-style kart racing. It wasn’t exactly a demanded feature by fans, and the result was a ham-fisted addition that didn’t feel entirely welcome. Vehicle segments were both forced (land) and optional (sea and air) and ranged from traditional racing to vehicular combat, 2D exploration, and shoot ’em up brawls. 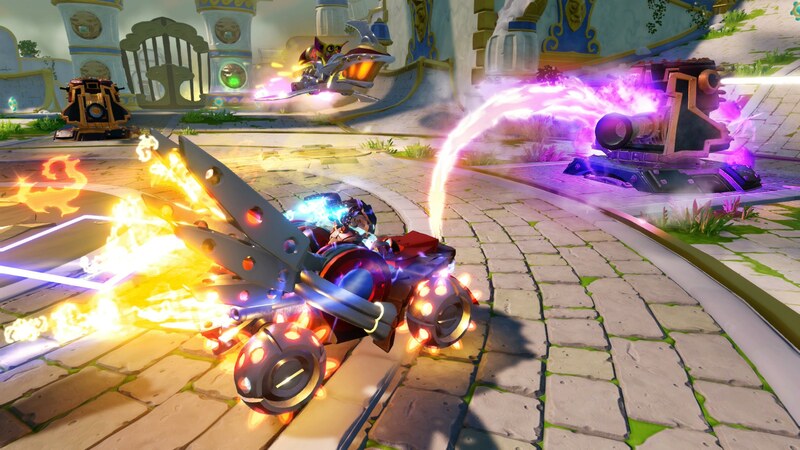 The Skylanders themselves played a diminished role during the often annoying vehicle segments, and the controls left a lot to be desired. The on-foot gameplay was still solid, and the figures were decent. While it was fun seeing new remixes of familiar characters, like a gun-wielding Stealth Elf, it meant less new characters overall. Ah, the inevitable Pokémon clone. For the fourth game, Trap Team lets you battle against a roster of fun new villains – and then capture them inside special trap crystals. Sold separately, of course. Playing as the villains was like a special powered-up mode and a lot of fun – particularly the way the captured villains taunted from the speakers on the portal itself. You needed one of each trap element to play as all the villains, but you could mix and match them within their elemental types. Much speculation was given as to how the traps would be incorporated into future games, and the answer was, unfortunately, not very well if at all. Save for a few standouts the new Trap Master figures were generally disappointing, and requiring them to unlock everything in the game was irksome. One standout feature that Trap Team added: tower defense survival mode. These were fantastic challenge modes, built for various levels of Skylanders, and a fun way to earn experience and level up outside the main game. They also played perfectly in co-op. For whatever reason, the mode was dropped in future games. 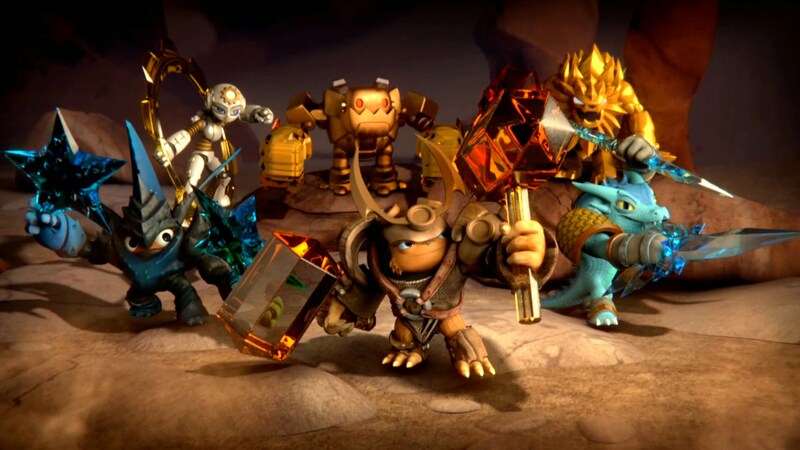 The third game in the Skylanders series was the first developed by Vicarious Visions, instead of series creator Toys for Bob. Like the annualized Call of Duty series, Activision would appoint two studios to keep up with the yearly output of new entries. Vicarious Visions created an excellent entry that provided some of the biggest, best level designs the series has ever offered. Plus you could finally jump, a first for the series that opened up the level designs even more. But the real treat was the incredibly cool swap gimmick. 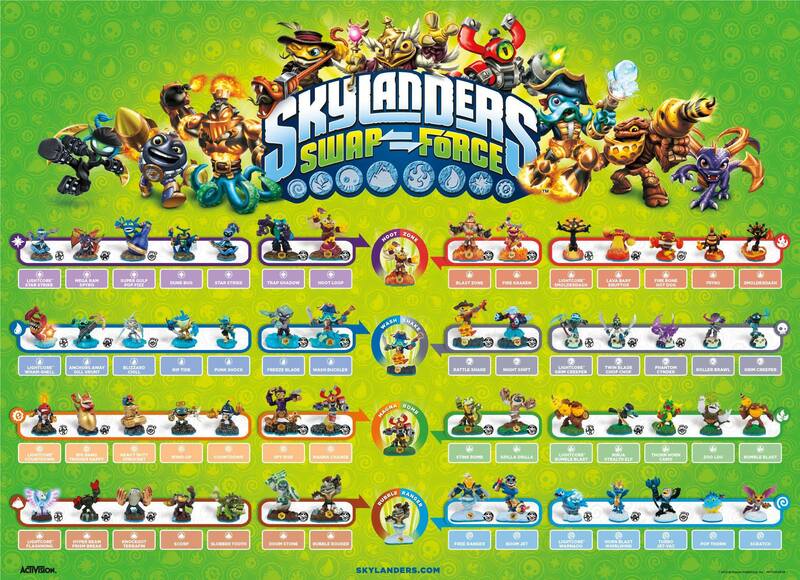 In one what is unquestionably one of the neatest concepts in a Skylanders game, special Swap Force figures could be taken apart and mixed together to create unique combinations. It was fun to play around with the toys, and also created a lot of really fun and interesting combos in-game, supported by new challenge mini-games and dual elemental gates. 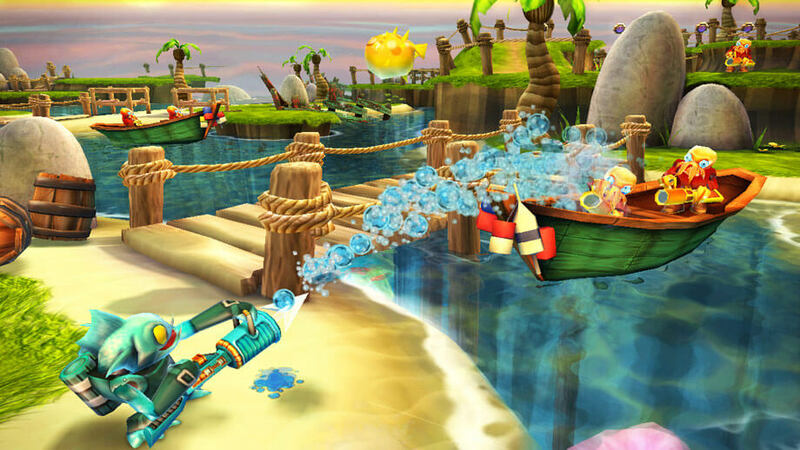 Swap Force also featured Time Attack and Score modes for providing challenging replay value, and was the last Skylanders game to include PVP arenas. It’s not fair to declare that Skylanders Imaginators was the first game to finally get it right, as each game had their strengths. But Imaginators combined a brilliant new gimmick, the best line-up of new figures, a fully realized loot system, and a more free-roaming overland map to create the best Skylanders experience yet. 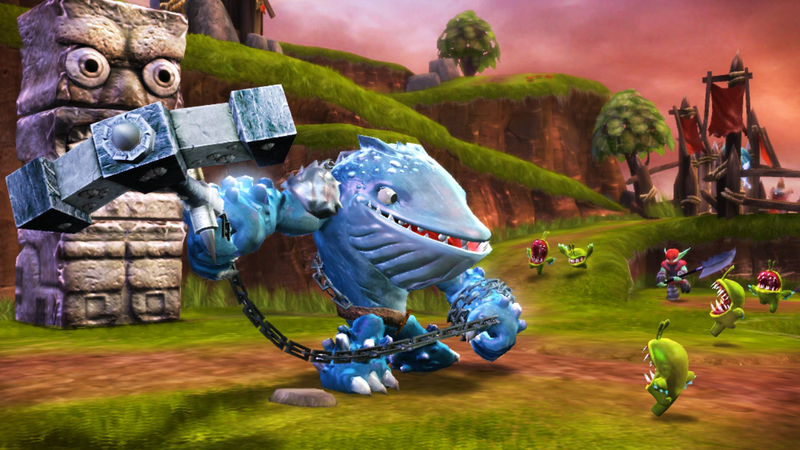 The ability to create your own Skylanders was made possible by piggy-backing on Trap Team’s trap concept. Separate Crystals were sold that could house a single created Skylander. The Crystal determined its element, while you could select on of 10 different weapon styles. Within those parameters, you had multiple basic attacks, weapon attacks, and elemental moves to choose from as you leveled up. All in-game rewards were tied to loot chests, which gave out new customization pieces, weapons, and skins for your custom Skylanders. There was an astonishing amount of loot to collect, making your Skylanders journey fun and rewarding, though they may suffer a bit from Frankenstein syndrome. Imaginators couldn’t gotten by on that concept alone, but Activision also released the best wave of figures Skylanders had ever seen. The Senseis were all new, medium-size figures that had the best designs and gameplay we’ve seen yet, and the Villains let us play as our favorites from Trap Team as proper leveled figures. Story structure and level design saw vast improvements as well. No longer were we stuck in a hub world, going through each level chapter by chapter. Now we could free roam around a board game-like overworld, exploring hidden secrets, taking side paths, and finding mini-games. It cannot be overstated how much this improved every aspect the game. If you can only play one Skylanders game, make it Skylanders: Imaginators. “Lightseekers is a really fun game that’s easy to learn and difficult to master,” said Willie Wilkov, Chief Marketing Officer for PlayFusion. Wilkov was kind enough to run through a full demo of the game for me at PAX, surrounded by an ongoing Lightseekers cash-prize tournament and numerous play stations. The card game, like the digital game, revolves around heroes – the Lightseekers. Every deck must contain a single hero, which is set in front of each player. This hero provides the player’s health bar, a unique Hearthstone-like ability, and determines which type of cards you can play. I played with the Mountain Starter Deck and the hero Dolo the Mighty. Each hero has access to three elements, which in total make up each of the six Orders. Mountain has Fire, Earth, and Crystal. Each deck is made up of five combo cards and 30 action, buff, or item cards. Combo cards are more powerful, but require a certain combination of elements in your hand. For example, to play my Stream of Tantos combo, I’d need to also have Fire, Earth, and Crystal cards in my hand. I spend those cards by shuffling them back into my deck and play the combo. Action cards simply do their action, and can be played up to twice a turn depending on the hero’s preferred element. This is in stark contrast to many CCG’s which often involve summoning creatures to battle one another. In Lightseekers it’s the heroes themselves doing the battling, and each player is playing cards to do instant damage, heal, or defend against incoming damage. The bulk of the strategy seems to be about timing. The main way to draw cards is to not play cards, so there are odd times of both players passing back and forth as they build up their hands, hoping to unleash a powerful combo while setting up defenses. Healing and damage mitigation were quite prevalent in both my Mountain deck and Wilkov’s Nature deck, causing our health to fluctuate back and forth during the relatively quick match. Not having to worry about multiple creatures on the board with individual health bars help streamline the entire experience and made Lightseekers feel unique. The other unique factor were the nifty rotating buff cards. “There’s a rotating buff mechanic where the cards at the start of your turn rotate 90 degrees, changing the value of the cards,” said Wilkov. “A lot of players really like that and it’s where a large part of the strategy comes into play.” Buffs are cards are placed in front of you with ongoing effects. Most have numbers in their corners, and they’re designed to rotate at the beginning of each of your turns, possibly changing how effective the card is, or setting up some cool traps. I played a Prism Cannon, which rotated on my next several turns. It did damage according to the number at its current rotation, but this was a patient trap. The first three numbers were ‘X’, doing nothing, but at the fourth rotation it would blast my opponent for eight damage, provided they didn’t find a way to get rid of it first. The rotating buffs mesh well with the idea of planning for big turns. At that same time my Prism Cannon went off, I had a second buff, the Colossi Ritual Site, rotate from its ‘X’ position to ‘3’, increasing all damage I dealt by that amount. It boosted my Prism Cannon’s damage from 8 to 11, perfect timing! Every card is also imprinted with a unique digital code, represented by dots on the border. “You can scan and use these cards in the action-adventure roleplaying game,” said Wilkov. “Each card grants rewards and abilities in the game. It’s a blend of the physical and the digital.” The Lightseekers mobile game (iOS, Android, Amazon) is a rudimentary free-to-play action-RPG. Most cards activate temporary buffs, abilities, or allies, while combo cards unlock permanent new skills for your heroes. Lightseekers looks like it’s designed for standard one-on-one battles, but it actually scales for multiple people. “We’ve played in the office with up to seven players,” said Wilkov. The multiplayer rules (and the cards themselves) specifically make separate reference to targets and enemies, and uses a system of gaining victory points for eliminating your personal targets. Each of the six orders are available as a starter deck, containing one hero, 5 combo cards, 30 action cards, and a booster pack, as well as a tuckbox for storing cards. Each booster pack includes nine cards, and always contains one hero card, one rare, and two uncommons. I was given the Intro Pack, which contained starter versions of the Storm and Tech Orders, two fold-out paper battle mats, and a booster pack. The battle mats are a nice way to keep things organized, even though Lightseekers is already very light on card clutter given only the buffs and items remain on the board. I have played a lot of collectible card games, and many that were aimed at a younger crowd. It’s not hard to see the instant appeal of Lightseekers. The artwork is solid, the rules straightforward, and rotating cards to access different variations is a neat system. You can build entire deck strategies around combo cards, though pulling too many from booster packs can be annoying since you can only ever include five in your deck. I can see Lightseekers filling a nice mid-tier void somewhere between Pokémon and Magic: The Gathering. I hope it can succeed among the always competitive marketplace of collectible card games.